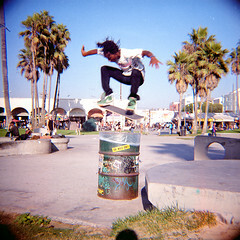 Skater at the Venice Beach skate park. I'm so stoked that I caught this one! This guy was one of the better skaters out there. He had moved the trash can in front of the ledge, and I knew what he was planning. His first try he ended up hitting it a bit, but this was his second try. I had placed myself directly on the side of it and waited for him to leap over it. When I hit the shutter, I knew that I had captured him directly over the can. That's one great thing about the Diana+ -- no shutter lag.